You are Kimberly, a girl sent to a temple in Asia to interpret some writings. You are chosen for you are the only one who can read them. But, the woman who sent you has some evil plan about stealing a valuable relic that holds the power to destroy the world. From an underground temple in Asia to the ruined city of Italy, you must take the journey in order to stop them from getting that valuable treasure. 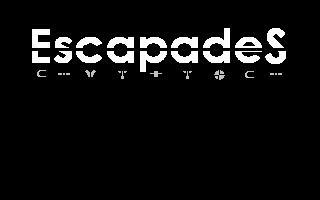 "Though not completely disappointing, "Escapades" presents very little to merit a download and a playthrough. "